Only files split into the form filename.001, filename.002, filename.003 and so on are supported. If there's a missing section, e.g. filename.010 of a 30 file set, the join process will stop after processing all the files up to the missing one and you'll end up witha partially joined file that's probably of no use to you.. The program is free to use and I hope you all find it useful. As this is freeware and a pretty simple program I do not offer any support. Steve Murphy's File Joiner is released as freeware. I retain copyright and IPR. Feel free to pass the program on to whomever you wish with the simple proviso that you do not charge for it. The software is provided without warranty on an as-is basis. It has been tested only on Windows XP and NT platforms but should work OK on Vista etc. 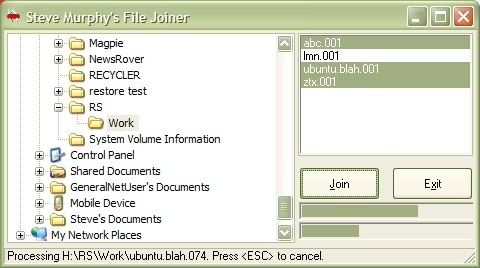 Renamer was written using Microsoft Visual Basic V6. When you install it, the necessary VB runtime files will be copied to your hard disk.